For the past couple of years, Sketch has been rising in popularity among designers around the world. While it still has not replaced Photoshop as a viable design tool, it has earned a spot for itself in the design workflow of many creatives around the world. Available for only Mac users, Sketch is easy to use and has an intuitive interface, making a bloat-free solution for anyone looking for a powerful design app. Owing to its popularity, finding extensions and plugins for the Sketch app is not a tough task, and a quick Google search can get you hundreds of Sketch extensions, both free and paid. That said, there was an empty space in terms of an official repository for Sketch extensions so far; this void has now been filled: Sketch now has a dedicated page meant for Sketch extensions. Currently, the Sketch Extensions repo is divided into two broad categories: integrations and plugins. Integrations are few in number, with currently only 10 official app integrations being offered. Plugins, however, are rising in count as we speak, and more and more third party developers are encouraged to create and submit their plugins for inclusion in the official extensions page. Much like WordPress repositories for themes and plugins, Sketch Extensions page too features plugins that are developed by the community and submitted to the repo. You can use the search function to look for specific plugins, or browse through the popular and featured plugins. Among other things, Sketch has also released detailed developer docs for folks who might be interested in building plugins for the Sketch app. So far, due to lack of an official channel, many developers were publishing their Sketch plugins on GitHub, but it is now expected that more and more developers will be shifting towards the Sketch Extensions page. 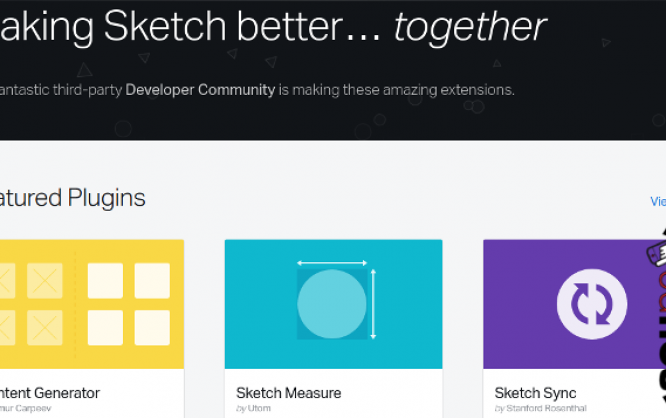 You can visit the Sketch Extensions collection on this page. Also, if you are interested, you can learn more about plugin development for Sketch in the documentation. What do you think of the Sketch Extensions page? Share your views in the comments below!